Todays portrait photographers owe a debt of gratitude to old-school pin-up and glamour photographers, who knew how to entice viewers with images that ooze with a playful, come-hither sexuality. The subjects were impeccably posed, lit, attired, and directed to ensure that every portrait was evocative and gave viewers insight into the womans personality whether she were a smokey-eyed siren or a girl-next-door type. 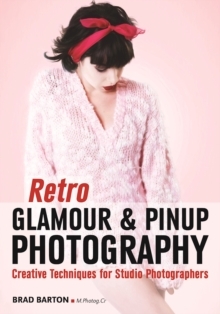 In this book, award-winning photographer Brad Barton (Fort-Worth, TX) compiles 60 memorable final portraits, behind-the-scenes shots, and image alternates that show a range of styles that duplicate (and re-invent) vintage looks his clients and portrait recipients love. Readers will learn how to connect with clients, create effective lighting setups, correct perceived flaws through posing, drum up playful prop-and-set combinations to develop a portrait theme, and more. Readers will also find a host great tips for maximizing each image through thoughtful and efficient post-production work. Armed with the tips in this book, beginners and pros alike will find a renewed creative vision and have at hand the powerful tools required to bring their portrait ideas to life.